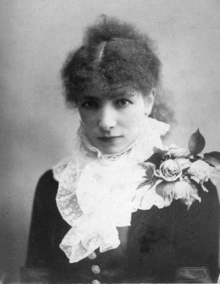 Ban-aisteoir Francach í Sarah Bernhardt, a rugadh ar an 22 Deireadh Fómhair 1844 agus a fuair bás ar an 26 Márta 1923. Rugadh Bernhardt i bPáras agus fuair sí bás sa chathair chéanna. Cuireadh i Reilig Père-Lachaise í. Deirtear gurb í Bernhardt "the most famous actress the world has ever known".